John Gorton was the only senator ever to become Prime Minister. Traditionally, prime ministers come from the lower house – the House of Representatives. Shortly after becoming Prime Minister, Gorton stood for – and won – a seat in the House of Representatives. Gorton believed in strong Commonwealth power over economic management and this made him unpopular with the state Liberal premiers. He was Prime Minister for three years until he was removed from office by his own party after a vote of no confidence in his leadership in 1971. He actually voted against himself in the ballot, making him the only Prime Minister to vote himself out of office. John Grey Gorton was born on 9 September 1911, probably in Melbourne, Victoria. Gorton was the second child of John Rose Gorton and Alice Sinn. His father was an immigrant who had come from England via South Africa, where he had acquired wealth as a business entrepreneur. His mother died when he was seven. Gorton was educated at the Headford Preparatory School of Sydney Church of England Grammar (‘Shore’) School, then Geelong Grammar School. He finished his education at Oxford University in the UK. After graduating from Oxford he returned to Australia to manage his father’s orchard at Kerang, Victoria. He married Bettina Brown in 1935, and they had three children. Gorton enlisted in the Royal Australian Air Force (RAAF) on 8 November 1940, and trained as a fighter pilot. He served in the UK, Singapore, Darwin and Milne Bay (Papua). He was severely wounded in a plane crash and was given reconstructive surgery, and was discharged from the RAAF on 5 December 1944 with the rank of Flight Lieutenant. Gorton entered local government after resuming management of the family property at Kerang. He was a member of Kerang Shire Council from 1946–1952, and president from 1949–1950. He joined the Country Party but later switched to the Liberal Party. In June 1949 he was narrowly defeated for election to the Victorian Legislative Council. 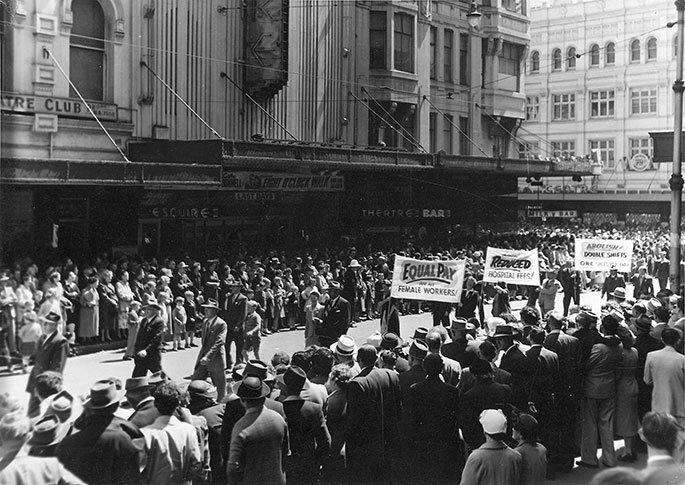 Gorton successfully stood as Senate candidate for Victoria at the general election in December 1949. He retained his Senate seat through the next four Senate elections: 1951, 1953, 1958 and 1964. He became Minister for the Navy in Robert Menzies’ Liberal-Country Party (CP) coalition government on 10 December 1958, and retained the position for the next five years until December 1963. During the 1960s he served in other portfolios: Minister Assisting the Minister for External Affairs, March 1960–December 1963; Minister-in-charge of Commonwealth Scientific and Industrial Research Organisation, February 1962–December 1963; Minister for the Interior, December 1963–March 1964; Minister for Works, December 1963–February 1967; Minister-in-charge of Commonwealth Activities in Education and Research under the Prime Minister, December 1963–December 1966; and Minister for Education and Science, December 1966–February 1968. He was also Leader of Government in the Senate from 16 October 1967–1 February 1968. After the disappearance and presumed drowning of Harold Holt in December 1967, John McEwen, the caretaker Prime Minister, threatened to withdraw Country Party from the coalition if William McMahon was elected Liberal leader. Gorton took advantage of this potential rift within the Liberal-Country Party coalition and stood for election as party leader. To preserve coalition unity, McMahon opted not to contest the leadership. John Gorton was elected as Liberal Party leader on 9 January 1968 and was sworn in as Prime Minister the next day. He became the first senator to be appointed Prime Minister. He resigned from the Senate on 31 January to contest the by-election for Holt’s former seat of Higgins on 24 February. Gorton won Higgins easily and held it through the next three general elections: 1969, 1972 and 1974. Gorton held the position of prime minister for three years, until 10 March 1971. He took the Liberal-CP coalition to victory at the general election on 25 October 1969. However, the coalition lost 18 seats, mainly Liberal, to a resurgent Labor Party. Labor’s total vote was 3.6 per cent higher than that of the coalition, which retained power only by preference votes from the Democratic Labor Party. Gorton’s years as Prime Minister coincided with increasing pressure for social change. The Commonwealth Arbitration Commission established the principle of ‘equal pay for equal work’ for women in June 1970, and ruled for pay increases to be phased in over three years. Mounting opposition to the Vietnam War resulted in huge public demonstrations on 8 May 1970, when Vietnam Moratorium Day marches were held in all state capitals. Gorton came into severe conflict with the premiers, in particular the Liberal premiers of Victoria and New South Wales, Henry Bolte and Robin Askin, and the Country Party Premier of Queensland, Johannes Bjelke-Petersen, over his ‘centralising’ ambitions. His dispute with the states over his government’s legislation on off-shore mineral rights in May 1970 factionalised the government. This, and his eccentric personal style, became matters of public controversy, contributing to the mounting dissatisfaction with the leadership within the Liberal Party. This dissension within the Liberal Party led to a party room challenge from William McMahon and other contenders on 7 November 1969. Gorton survived the challenge, but opposition within the party mounted. In a party room meeting on 10 March 1971, a motion of confidence in his leadership was tied 33:33. Gorton then gave his chairman’s casting vote against the motion, effectively removing himself from office. McMahon won the Liberal party vote for the leadership (and thus became Prime Minister) in March 1971. Gorton contested the vote for Deputy Leader and won. He accepted the position of Minister for Defence in McMahon’s government. However, after publishing a series of newspaper articles titled ‘I Did It My Way’ which were critical of cabinet, Gorton was forced to resign his Ministry on 12 August 1971. He gave up the deputy leadership four days later. After the election of the Labor government led by Gough Whitlam on 5 December 1972, Gorton joined the Opposition’s executive and served as Liberal spokesperson on urban and regional development, environment and conservation. He opposed the appointment as Liberal leader of John Malcolm Fraser, whose resignation as Minister for Defence from his Cabinet in March 1971 had triggered McMahon’s successful challenge to his prime ministership. During his years as a member of the Opposition, Gorton also supported abortion law reform and homosexual law reform. Gorton quit the Liberal Party in November 1975 when, with the dismissal of Whitlam by the Governor-General, Fraser’s campaign to oust the Labor government succeeded. Gorton then stood unsuccessfully as an independent Senate candidate for the Australian Capital Territory at the general election on 13 December 1975. Gorton retired from politics after the 1975 elections and lived quietly in Canberra, occasionally making headlines through interviews granted to journalists. After the death of his first wife in 1983, Gorton married Nancy Home in 1993. He was readmitted to the Liberal Party in July 1999, and died in Sydney on 19 May 2002. The Copyright Act 1968 made Australia a party to an international copyright convention. The Australian Industry Development Corporation Act 1970 enabled overseas capital to be raised for loan funds to assist Australian companies. The Maritime Conversion Act 1970 established a board to oversee the introduction of metric weights and measures. The Australian Film Development Corporation Act 1970 (since replaced by later legislation) provided for the first Commonwealth assistance to the film industry.